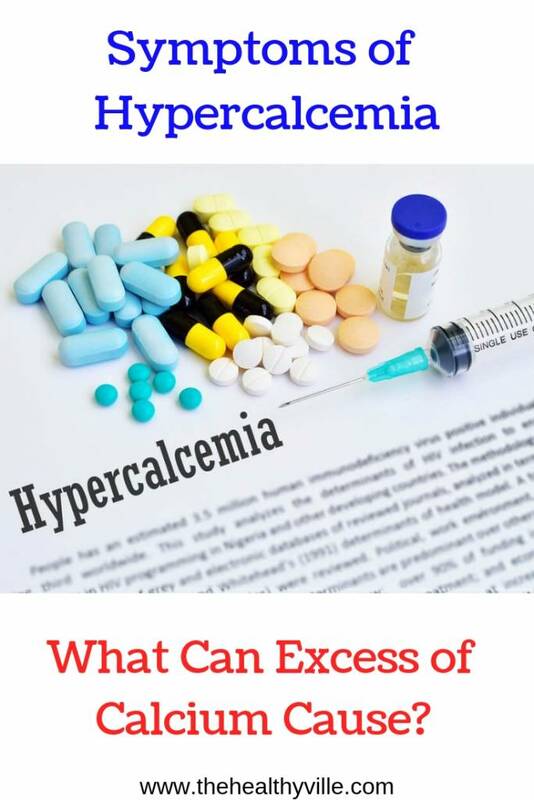 Symptoms of Hypercalcemia – What Can Excess of Calcium Cause? Home Health Symptoms of Hypercalcemia – What Can Excess of Calcium Cause? There are several symptoms of hypercalcemia. Discovering them on time can actually save you from more severe consequences. Having too much calcium in the blood can weaken the bones, form kidney stones and interfere with the functioning of the heart and brain. Hypercalcemia is an alteration of calcium levels in the blood. In this case, there is an increase in these levels. If, on the other hand, there is a decrease, we would speak of hypocalcemia. Further info: These Are The High Calcium Sources You Need To Strengthen Your Bones And Prevent Their Wear! Calcium in a mineral essential for the proper functioning of the organism. It is an essential constituent of the skeleton. In addition, it is essential for certain vital functions of the cells to be carried out. Calcium also participates in the nerve transmission and movement of intracellular organelles. In turn, it is essential for muscle contraction of smooth or fluted fibers to occur. It also participates in the release of certain mediators and in the process of coagulation. Finally, it acts as a second messenger in some enzymatic reactions. However, an excess of calcium is not good. When the levels of this mineral are greatly increased there are very negative consequences in the organism. Calcium is an essential mineral for the body, which in excess can cause problems. People who have mild hypercalcemia usually do not have symptoms. However, in the most severe cases, signs and symptoms of hypercalcemia are related to different parts of the body develop. The last symptom on the list can actually appear from many other things. For instance, severe bloating and constipation can be a result of these 3 unhealthy habits. Although calcium is essential for the proper maintenance of the skeleton, in most cases this increase in calcium levels in the blood comes from the bones. This fact causes the bones to be more weakened and pain occurs in them, muscle weakness and depression. On the other hand, hypercalcemia can also have consequences for the brain. In this case, excess calcium interferes with the proper functioning of the brain. Something that results in episodes of fatigue, disorientation and lethargy. Finally, cardiac function is also affected by this condition. In this case, palpitations and fainting may appear. These two symptoms are indications of cardiac arrhythmia and other heart problems. The hyperactivity of the parathyroid glands usually causes the symptoms of hypercalcemia. It is about four very small glands that are just behind the thyroid gland. Hypercalcemia can also develop if the patient suffers, in turn, some type of cancer or other specific medical disorder. Causes of this alteration can be, in addition, some medications and the excessive consumption of supplements of calcium and vitamin D (favors the absorption of this mineral). Immobility: people with diseases that require them to sit or lie down for a long time usually suffer from hypercalcemia. This is because bones that do not support weight release calcium into the blood. Dehydration: when there is less fluid in the blood, calcium concentrations rise. Medications: Lithium, a medicament for bipolar disorder, is an example of a medication that can increase the release of the parathyroid hormone. Other diseases: apart from cancer, tuberculosis and sarcoidosis are diseases that can increase the levels of vitamin D that, as we have said, stimulate the digestive tract to favor the absorption of calcium. Depending on the cause, the treatment for hypercalcemia will be different. The treatment of this alteration of calcium levels includes focusing on treating the trigger. Thus, people who have hyperstimulated paratoid gland, usually undergo surgery to remove it. However, those who have mild hypercalcemia, as they do not usually have symptoms, can simply monitor their condition for a while without the need for treatment. As for severe hypercalcemia, it usually requires hospitalization. It is usually treated with fluids administered through a vein. This is the most important treatment. In addition, calcitonin may be administered or dialysis performed (in cases where the kidney is involved). It is also possible to administer diuretic drugs such as furosemide or drugs that stop the breakdown and absorption of bones. Don’t forget to SHARE the symptoms of hypercalcemia with your friends and family on your social networks!